This is a fascinating combination of four contrasting maps of the same area a single sheet. All four maps cover the northeastern part of America and Greenland, including the Hudson, Button and Baffin Bay regions, the Davis Straits and the Coast Labrador. 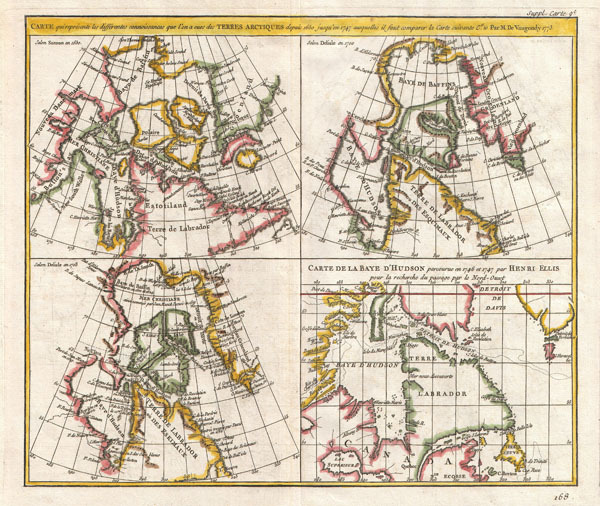 The upper left map depicts the work of Sanson in 1650, the upper right map the work of De L'Isle in 1700, the lower left map the world of De L'Isle in 1703 and the lower right map the work of Henri Ellis in 1747. This four map chart is one of the earliest examples of comparative cartography. Prepared by Vaugondy as plate no. 9 for the Supplement to Diderot's Encyclopédie. Pedley, Mary Sponberg. Bel et Utile: The Work of the Robert de Vaugondy Family of Mapmakers. 462. Wagner, Henry R., The Cartography of the Northwest Coast of America to the Year 1800,, 637. Kershaw, Kenneth A., Early Printed Maps of Canada, 476.